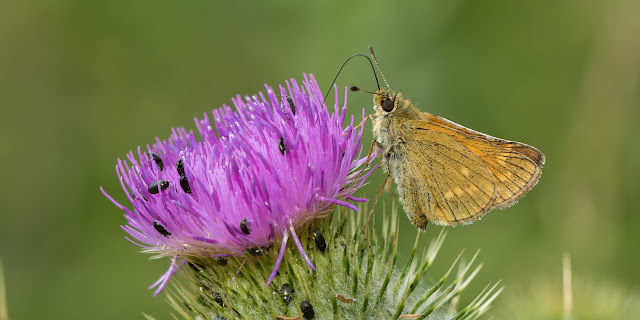 This year has been by far the best year for butterflies locally since I moved to Thrintoft; I've discovered new colonies of favourites and new species too. 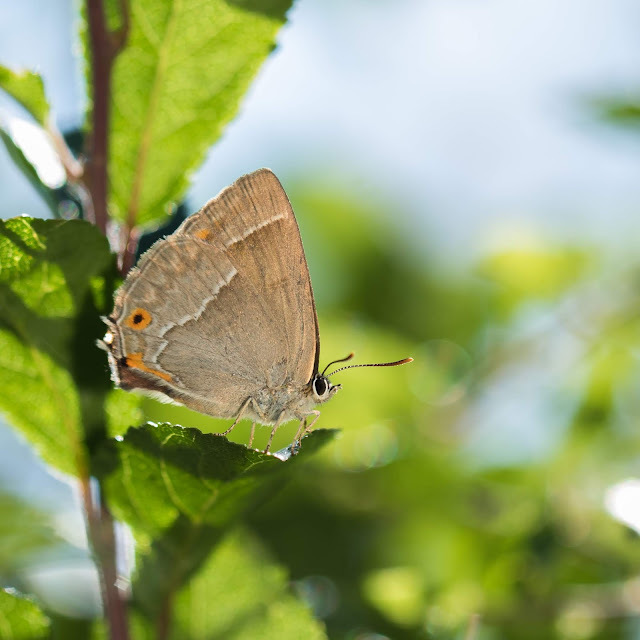 White-letter hairstreak are still doing well down Myers lane and the relentless sunny weather made watching them more enjoyable than usual. Always in the treetops, I've yet to manage a decent photograph of one yet. They come down to drink pollen from flowers only during drought, but I checked the adjacent fields nonetheless. 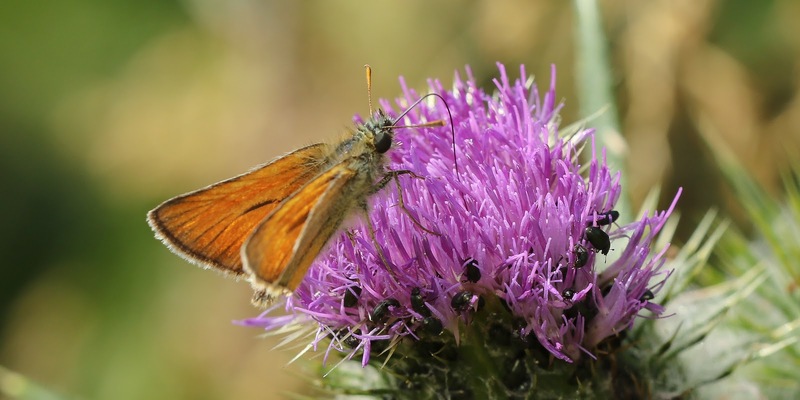 Though I didn't find any hairstreaks, I did stumble upon a new (to me) colony of both small (top) and large skipper (below). Blue butterflies are like hens teeth on the patch, so I was thrilled to find a holly blue on the buddleia in the garden. The buddleia has been a big draw this year, attracting tortoiseshells, peacocks, red admiral, painted lady, comma, wall, meadow brown, ringlet and all the white butterflies. 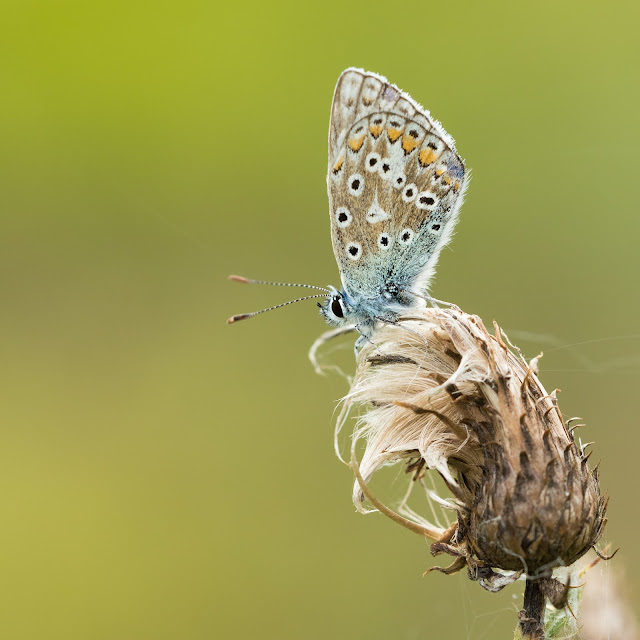 Today, I headed to the north of the patch to check on the lone (that I know of) colony of common blue on the patch. They can be found roosting on the tops of grass and other tall plants when the weather is cool and overcast. Later this afternoon while walking to Warbler Corner, I found another blue... 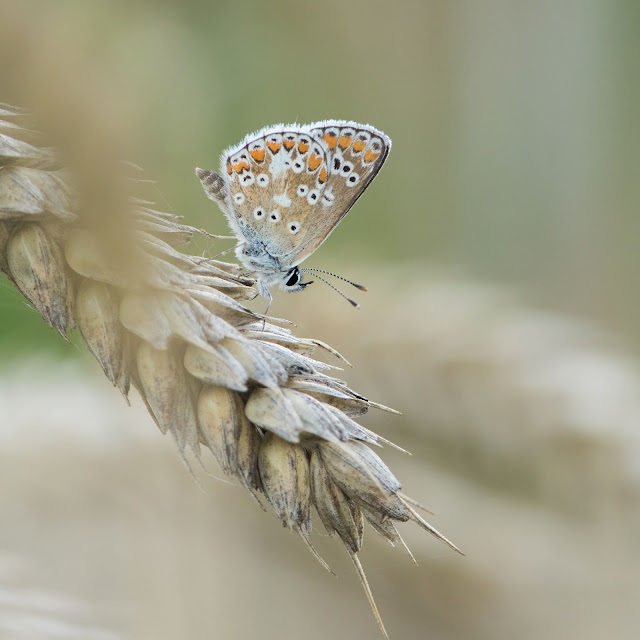 I thought it was a female common blue blown in the wind from the railway embankment colony on Nick's patch, but a closer look reveals it to be brown argus; a new species for the parish! Since the cuckoo, it's been a real struggle on the patch. An inevitable lesser whitethroat eventually showed up in late May, and a singing sedge warbler looked like it might hang about on the Ings before it disappeared after a couple of weeks. However in the last couple of weeks, there have been signs that Autumn is upon us and the birding might get a bit better. Redstart is becoming something of a regular bird and they tend to show up at the same places, as it was on 4th August when a male bird was briefly seen along the Thrintoft to Morton-on-Swale footpath. From the garden I've ticked off all the birds of prey this year! A hobby yesterday added to peregrine, red kite, buzzard, sparrowhawk, kestrel, barn owl, tawny and little owl garden ticks! Fingers crossed I can attract enough small birds to the garden to draw in a winter merlin. Finally, to reach 105 species and my best ever year, a greenshank passed briefly through warbler corner today, where incidentally the sand martins continue to bring food to what must be their third brood of chicks? It's been a cracking year for butterflies, my garden has new species and the regulars in abundance, a good time for finding new spots for them, it's paid off for you!